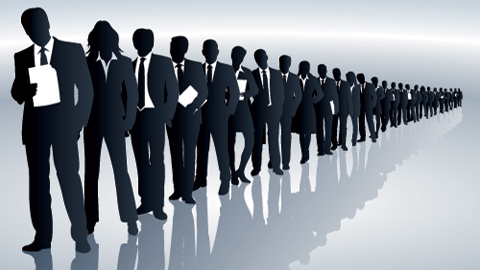 Employment will continue to grow in the second quarter of 2013, but applicants are set to face stiff competition in the jobs market, with 45 applicants chasing each low-skilled job. This is according to the latest Labour Market Outlook data released today by the Chartered Institute of Personnel and Development (CIPD), which highlighted a fifth consecutive quarter of projected growth in employment, but warned of a “battleground” for jobseekers. The report, which uses a net employment balance measuring the difference between the proportion of employers planning to increase staffing levels and those planning to decrease them, predicted a quarter-on-quarter increase from +5 to +9. However, this was accompanied by a warning that the jobs market is becoming increasingly challenging for jobseekers with less experience, skills or qualifications, and highlighted how some jobseekers are excluded from the recruitment process altogether. Some 14% of employers said they would not consider recruiting school leavers, and 11% said they would not consider candidates who had been long-term unemployed. However, it is not only low-skilled or entry-level jobseekers who can expect to find it difficult when applying for roles. The survey also found that there was an average of 29 applicants for every medium-skilled vacancy and 10 applicants for each highly skilled role. Gerwyn Davies, CIPD labour market adviser, said: “Even though last month’s official figures showed a slight dip in the level of employment, these findings suggest that further employment growth is possible. However, with a projected increase of half a million people to the UK population over the next 12 months, the number of jobs being created may fail to keep pace with the population growth. In this scenario, we could see employment rising accompanied by increases to unemployment; as the Office for Budget Responsibility expects. “Against this backdrop, it is perhaps unsurprising that the labour market at present is a battleground for jobseekers, particularly those with fewer skills or qualifications. For more on recruitment and the labour market, sign up to receive Personnel Today’s recruitment and resourcing e-newsletter. XpertHR also has a range of recruitment-related information and data.